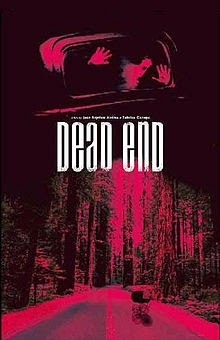 Dead End: So Bad, I'd Forgotten I'd Already Seen It. Compared to most people, I watch a lot of movies. I watch so many movies, in fact, that sometimes I re-watch them because I've completely forgotten having seen them already. This is one of many reasons that I love the ability to rate movies on Netflix: it helps me remember watching them and it's like an archive of things I've previously watched. Pretty sure I also blog to remember which movies I've watched. I don't necessarily believe that my terrible memory is the only reason I forget having seen some movies. I'm going to go out on a judgmental limb here and suggest that some movies are just so bad that I have blocked them from my memory and others are too bland, generic, whatever to be worth remembering. I think Dead End falls somewhere in between those concepts; it's pretty awful but it's also pretty boring. I'm actually torn here and am not exactly ready to call it an out and out terrible movie, because I have definitely seen worse in my day, but I'm not convinced it was simply dull. I actually put this one on because it stars Ray Wise (Twin Peaks, Reaper, so many other things!) whom I love and adore and simply can't get enough of. He always manages to play the perfect mix of charming and menacing with this dash of dry, snarky humor on top of it all. What I didn't know, or remember, is that Steve Valentine (Crossing Jordan - which, side note, also starred one of my favorite Twin Peaks cast members, Miguel Ferrer.) has a small role at the end of the movie. I'm also sort of nuts about him. About 10 minutes into the movie, I remembered having seen it before (possibly when it came out). I decided I'd stick it out until the end and see if viewing number two would make me feel any better about it - or at least get it to stick in my head. It's hard to hate the plot - it's really just another take on a classic, urban legend, "The Lady In White". If you don't know the story, the gist of it is that a traveler (usually in a car) in a lonely place (usually an old, un-used road) sees a woman (or girl) in white and offers her a ride. They will have some kind of strange conversation in which she reveals a scary or dramatic sounding secret and then, at some point, simply vanishes. She is, of course, a ghost. Typically she was killed in that lonely place and is "doomed" to haunt that location. Some times she is a warning and "saves" the traveler from meeting her same fate. Some times she is more malevolent and kills the traveler so that she is not alone anymore. Do a little leg work and you'll find many, many, many versions of this story across history. I don't mind a good re-telling, but you have to add some sort of value if you want me to buy a product (or story) I've already bought before. Unfortunately, Dead End didn't bring anything new to the story so it left me fairly unfulfilled. 1. You clearly haven't watched enough movies or read enough books in your life. 2. You clearly haven't played enough video games in your life. Number 2 may actually be a blog post unto itself about problem-solving skills and playing video games. So hold onto that thought and remind me to come back to it another time. Overall, the acting was pretty bad. The only person who even made a passable effort was Lin Shaye - who will always be the flustered high school teacher in Nightmare on Elm Street to me. (Side note, I'm pretty sure she ended up in that role because her brother was the CEO of New Line Cinema at the time Nightmare was made). She actually, rightfully, won a few awards for her performance in this movie. Her pendulum swing from deadpan to explosive and back again is a clear mark of her character actor background. So, I'm not sure I'll actually remember having watched this movie (without reading this blog post) but I can say that I've wasted days on worse movies before. (Yeah - ask me about Hansel and Gretel: Witch Hunters some time).